You can’t log on to any social network these days and not see a selfie. Selfies have actually become so popular that Webster has decided to add the word to the dictionary! Have you ever taken a selfie? If so, you know how important a great looking smile is. When taking a selfie you want to make sure your teeth are looking great. 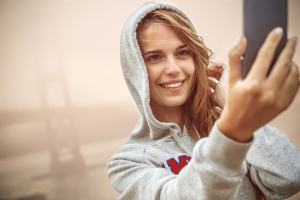 If you follow these 5 rules you will take the best possible selfie. It’s simple. Drinking coffee on a regular basis can slowly stain your teeth. Can’t kick the coffee habit? Try iced coffee through a straw. This will diminish the amount of coffee that comes in contact with your teeth. Did you know that you should change your toothbrush every 2-3 months? No matter how much you rinse your toothbrush after brushing, the head of your toothbrush collects a lot of bacteria over time. The less bacteria that there is on your toothbrush, the more work it can get done on your teeth. You know the rule; brush your teeth when you wake up and again when you go to bed. With all of the food that builds up during the day, it’s important that you are trying to get rid of the food in your teeth that has built up throughout the day. How often do you visit your dentist? We recommend that you visit your dentist twice a year, or every 6 months. These bi-yearly checkups are a great way to make sure that your teeth and staying strong and healthy. This tip is just for the ladies. Did you know that wearing a medium coral or light pink lipstick helps your teeth look whiter? Try and avoid lighter colored lipsticks. They tend to bring out yellows in your teeth. Now you are ready to start taking amazing selfies! Next time you take a selfie at your favorite place in Indy make sure to use the hashtag #SMILEINDY. We will RT and post our favorites!